Harp v0.11.1 was released this week, adding support for HTTP Basic Authentication. This makes it easy to password protect an entire Harp app. You may omit sudo if you’re using Windows. If you’re interested in part of the story behind Harp, I think you’ll enjoy this article by John Gray. Rob Ellis also wrote about at Harp’s implicit preprocessing, and why you might want to move away from configuration-dependant setups. He says if you’re writing configuration to manage your assets, you’re doing it wrong. 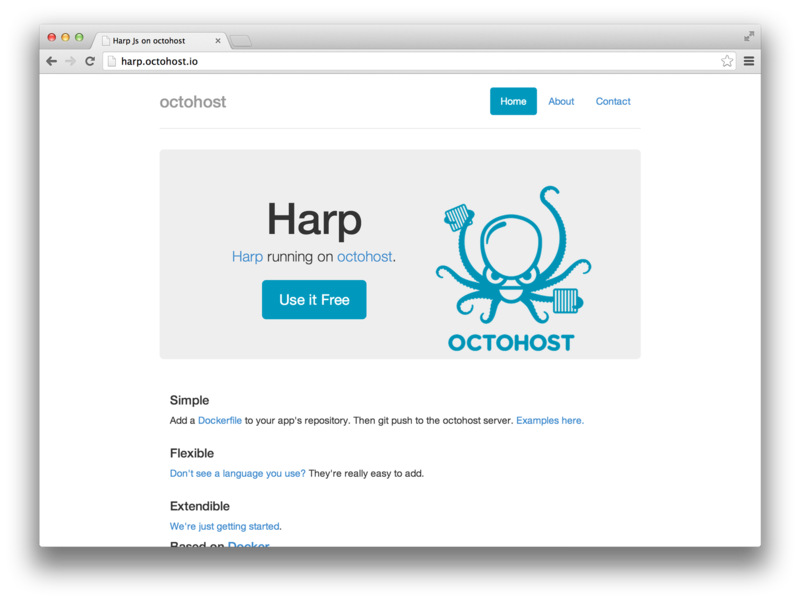 Octohost is a Heroku-esque platform based on Docker, with support for Node and Harp. There’s a default application ready for you to clone on GitHub if you’d like to try out deploying there. The RSS feed recipe was improved this week, adding more details and comments. There was also a request for how to create next and previous links in a static blog using Harp. I’ve started with an examples on GitHub, and hb-remedy boilerplate boilerplate has been updated to have them, too. A full recipe is forthcoming! If you have any questions about getting started with Harp, or suggestions for recipes you’d like to see, the join the #harp IRC channel—it’s now available directly on harpjs.com. Another version of Harp is already in underway. Follow @HarpWebServer on Twitter to be notified first.